I spent the weekend preserving – tomato ketchup and pickled garlic. Here are the recipes. Either you will like this or you won’t – it is very sweet, which I love, but others say they think it is too sweet. But don’t cut down on the sugar as that is one of the preservatives in this recipe. 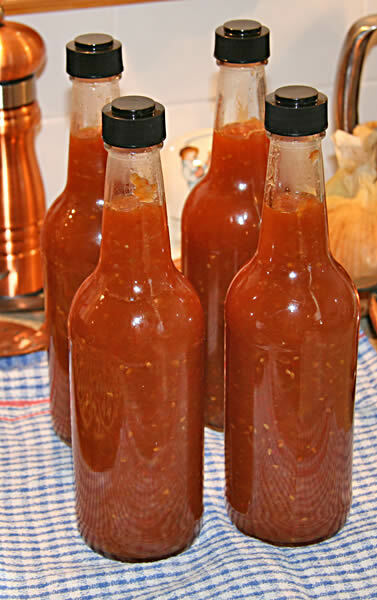 I have never hot water processed this ketchup – just bottle, shelve and use within the year. Refrigerate once opened. This is one of my favourite recipes, and I make this ketchup every year in batches as the tomatoes come in. 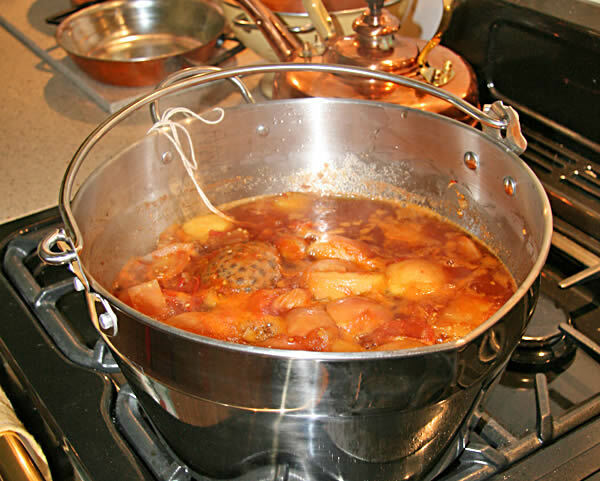 You will need: a large pot (either a preserving pan or a large stock pot); bottles and caps (which need to be sterile; pop washed bottles into an oven on a towel and bake for about 20 minutes at 110 C; simmer caps in a pan for about 10 minutes); a funnel to bottle up the sauce; a mouli or a blender to blend everything together once cooked. These quantities make about 2.5 litres. Roughly chop the unpeeled tomatoes and cored apples, and peel and chop the onions. Put into your pan or pot together with the vinegar and the sugar and start to heat. 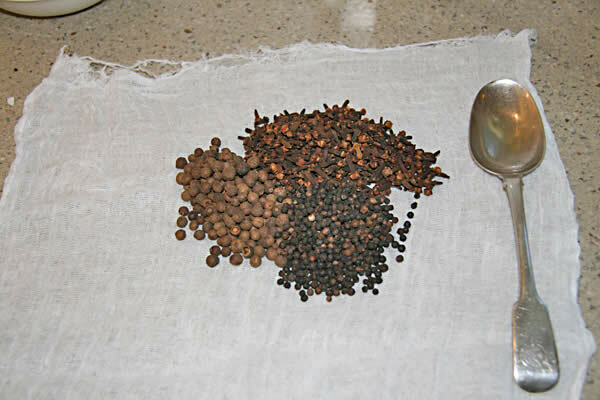 Tie the cloves, allspice and peppercorns in muslin and pop into your pot, tying to one side with a bit of string so it won’t get lost. If you don’t have any muslin or cheesecloth, I have just added these spices in powdered form direct to the mix – but you will need much less – just add to taste. Simmer everything down to a nice pulp for about an hour. Smells delicious! Keep the pot uncovered. 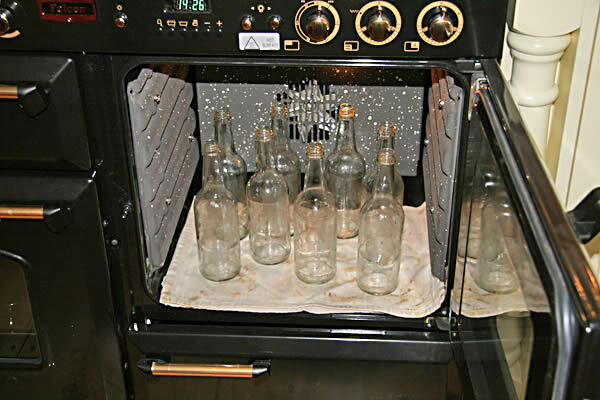 In the meantime, wash your bottles and caps and sterilise them – simmer caps in water for about 10 minutes, leaving them in the hot water until you need them, and put the wet bottles into the oven, standing them on a towel and baking for 20 minutes at 110 C.
Once it is simmered down, either blend the lot roughly, or put the mix through a mouli to remove all the skins. 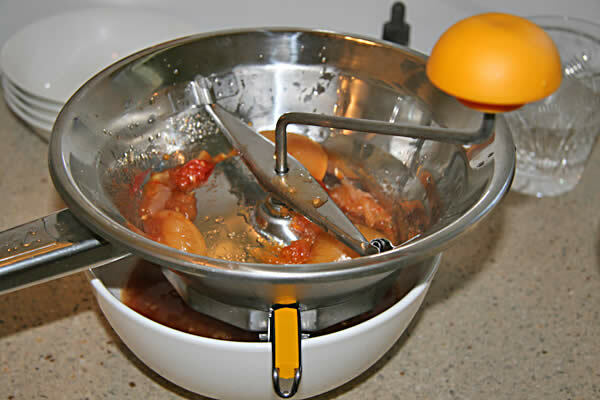 I have done both – the blender keeps the skins but they get chopped up, the mouli will remove them. Either or is fine. A mouli is less mess and faster than blending in batches. At this point, assess the sauce to see if it is too thin – you may need to put it back in your pot and reduce it to make it thicker. Bottle into the warm bottles and seal. Leave out to cool, then label with the name and date. Done! This is the first year I have had a proper preserving pan – love it. A stockpot is fine, but a preserving pan has a wider top than bottom, aiding reducing fast; it has volume markings inside (very useful); it has a handle which will lock at varying angles; and it has a pouring lip and side handle – even more useful. A good pinch of saffron strands. Have ready your warm sterilised jars. Break the bulbs into individual cloves. Peel each clove and pack them into the jars, dropping in the fennel seeds, peppercorns and bay leaves as you go. Put the vinegar, sugar and saffron into a pan. Bring to the boil and boil for a couple of minutes. Pour the hot vinegar over the garlic, then seal with vinegar-proof lids. Use within a year. These will be crisp but quite mild when used. Use in salads or to flavour roasting lamb etc. The peeling of your garlic will test your patience! I did a kilo of these yesterday and it took me almost 2 hours of grumbling to get it done – but the end product is well worth it. 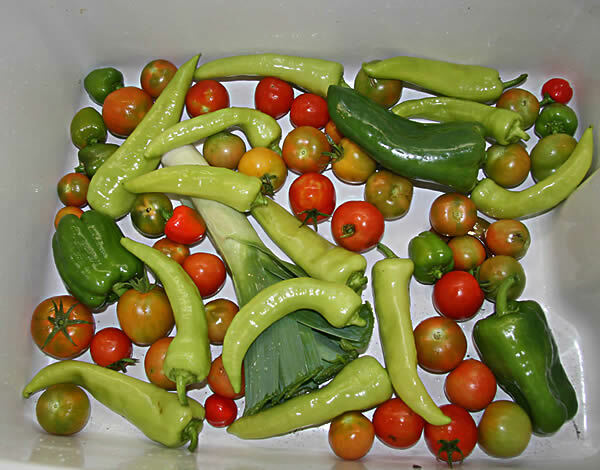 And finally – just a pic of a typical day’s pickings from the garden. So how long are you going to keep us hanging in suspense for big pictures of the kitchen?! I cant wait to see. That ketchup looks gorgeous 🙂 and I love the Weck jar – do you find them easy to use? And yes, these pictures are a real tease lol! Oh how I wish I had checked your blog first this morning Sara. I have just made a very simple tomato sauce, and bottling it..sigh yours sounds so yummy. Our garden is not the success I had hoped. Oh well lots of cherry tomatoes, I made a delicious yellow tomato soup. Kitchen love the stove. 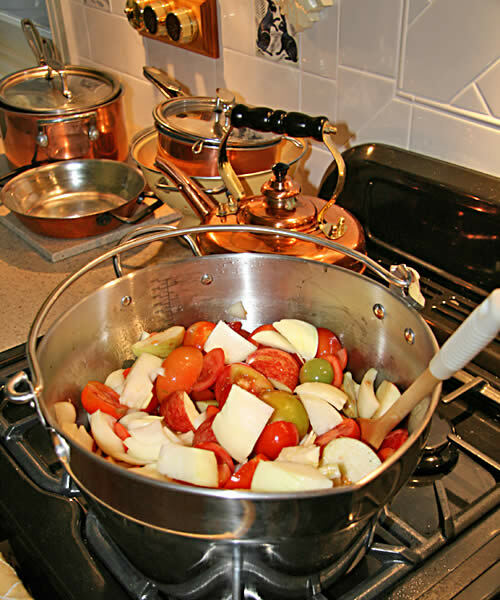 I have stove envy..
Where in the world did you find the preserving pan? I have been looking for one now for several years, and have not found one to my liking. I had to buy it in from England – they cost a fortune here. I bought it from ebay UK – search ebay UK for maslin preserving pan. Thank you! I have friends in England – I should send them on a mission to find one for me. I have a great mango chutney recipe that just doesn’t come out right in a pot. Reading through your recipes it struck me that the addition of pickled garlic to your tomato ketchup could only bring exciting results. 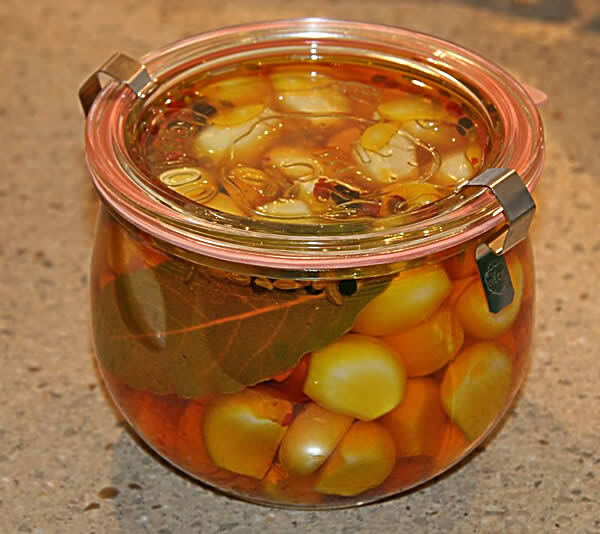 I have pickled garlic which is approximately 3 years old at home and I use the vinegar in my ketchups and salsa’s, bringing a wonderful spiced lift to all of them. The aged garlic when crushed and chopped is great when added to tomatoes and peppers, it provides depth of flavour and a real sense of legitimacy to every dish.